When you walk up to the windows of Peerless Gallery, it’s as though you’re looking at a framed piece of art. Upon entering, you engage Heidi Bartlett’s canvas. Bartlett, a Nebraska-bred mixed media artist crafted Peerless Gallery into Log Lines via wood, cut paper, deer hide and feathers. About a dozen tree logs line the entrance, descending from about eight feet to about three feet, welcoming you in. High upon the side-walls to atop the cut logs, are 200 thin 1-inch strips of butcher paper the artist (and two close friends, Kate Running and Madelyn Lorenzen) painstakingly cut straight in 15-foot long strips and pinned up to create unique architectural and spatial perspective from each area of the room. 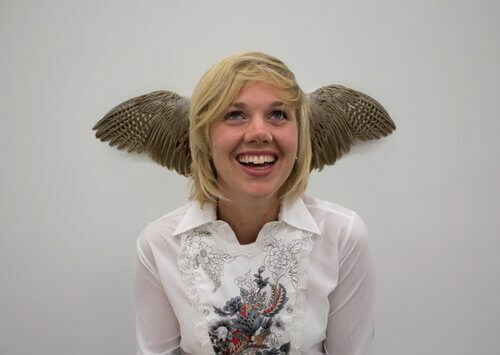 Another major aspect of her work involves human contact with nature and animals. In the back of the gallery, the wall is lined with “White Monarch no. 2-8,” seven Nebraska Whitetail deer hide masks tanned in the Platte River, with acrylic thread. Each is so carefully crafted with various tones and textures of the fabric. “Aeolian” seems to be painted on the wall, but the taxidermed Nebraska Pheasant wings with steel wire are somehow installed on the wall as canvas. Taking a step back in this position, viewing the logs by the entrance flanked with the paper strips at various angles, along with the masks and wings, at once you are inside the canvas Bartlett created. There are a few separate pieces that may not fit with the said gallery-as-canvas, but they show off Bartlett’s talent so not to be overlooked. “Territorial Longitude” and “Territoy” are two large cut lenox paper pieces; a shadow or a house and the detailed architectural plans of a house. Though the frames on the pieces seem to create a barrier in this otherwise organic-minded exhibit, the craft is appreciated with each tiny perfect cut of grass and stair. On the other side, “White Monarch no. 1” a single deer hide mask, sits alongside “Prototype 1/18” a small Nebraska Whitetail deer hide nose tanned in the Platte River, framed in a plexiglass box. Again, Bartlett’s organic style is evidenced with the natural sun tones and sewn pieces. Though the plexiglass seems out of place, it seems to serve as a reminder of the delicacy of her work with nature and animals around us. This ability to utilize nature in her work is what attracted Peerless curator Caleb Coppock to invite her to show at the Gallery. “I saw her 2011 show, A Little Chiffon Goes A Long Way at the Tugboat Gallery, and loved her use of logs, and immediately wanted her to come to Omaha to show. She’s got such amazing craft talent you can see in each cut of paper, as well as conceptual ideas, as with her performance which was so methodically planned and carried out,” Coppock said. After a residency at Elsewhere Collaborative in Greensboro, North Carolina Bartlett will head to graduate school at the University of Iowa to pursue her MFA in Intermedia and Drawing. Log Lines will continue through Aug. 25, 2012 at Peerless Gallery, 3157 Farnam St. For details go to wearepeerless.com.